I have a list view with a couple of image buttons on each row. When you click the list row, it launches a new activity. I have had to build my own tabs because of an issue with the camera layout. The activity that gets launched for result is a map. If I click on my button to launch the image preview (load an image off the SD card) the application returns from the activity back to the listview activity to the result handler to relaunch my new activity which is nothing more than an image widget. The image preview on the list view is being done with the cursor and ListAdapter. This makes it pretty simple, but I am not sure how I can put a resized image (I.e. Smaller bit size not pixel as the src for the image button on the fly. So I just resized the image that came off the phone camera. The issue is that I get an out of memory error when it tries to go back and re-launch the 2nd activity. Is there a way I can build the list adapter easily row by row, where I can resize on the fly (bit wise)? I know I can do an out of band resize and save of my image, but that is not really what I want to do, but some sample code for that would be nice. As soon as I disabled the image on the list view it worked fine again. Where R.id.imagefilename is a ButtonImage. 01-25 05:05:49.877: ERROR/dalvikvm-heap(3896): 6291456-byte external allocation too large for this process. 01-25 22:13:18.694: ERROR/dalvikvm-heap(4204): 6291456-byte external allocation too large for this process. decodeFileDescriptor looks like it calls different native methods than the decodeStream/decodeFile. I think there is a problem with the native function used in decodeStream/decodeFile. I have confirmed that a different native method is called when using decodeFileDescriptor. Also what I've read is "that Images (Bitmaps) are not allocated in a standard Java way but via native calls; the allocations are done outside of the virtual heap, but are counted against it!" same result out of memeory, actually it wont matter which method you are using it depend upon the number of bytes you are holding on to read the data that gives out of memory. What if the path is a url? * Loads a bitmap from the specified url. // to fit a image into a certain width. Nice, think it would be better to use a Loader instead of Async Task? How about Bitmap.Config.ARGB_565? If high quality is not critical. Generally android device heap size is only 16MB (varies from device/OS see post Heap Sizes), if you are loading the images and it crosses the size of 16MB , it will throw out of memory exception, instead of using the Bitmap for , loading images from SD card or from resources or even from network try to using getImageUri , loading bitmap require more memory , or you can set bitmap to null if your work done with that bitmap. After looking through all the answers, I was surprised to see that no one mentioned the Glide API for handling images. Great library, and abstracts out all the complexity of bitmap management. You can load and resize images quickly with this library and a single line of code. I wasn't saying it was a one stop solution. I was adding it to the toolbox for those that haven't heard of it. * Decode and sample down a bitmap from a file input stream to the requested width and height. * results in a larger bitmap which isn't as useful for caching purposes. // with both dimensions larger than or equal to the requested height and width. // be more aggressive with sample down the image (=larger inSampleSize). This issue only happens in Android emulators. I also faced this issue in an emulator but when I checked in a device then it worked fine. So please check in a device. It may be run in device. Such OutofMemoryException cannot be totally resolved by calling the System.gc() and so on . The Activity States are determined by the OS itself subject to the memory usage for each process and the priority of each process. I come from iOS experience and I was frustrated to discover an issue with something so basic as loading and showing an image. After all, everyone that is having this issue is trying to display reasonably sized images. Anyway, here are the two changes that fixed my problem (and made my app very responsive). 1) Every time you do BitmapFactory.decodeXYZ(), make sure to pass in a BitmapFactory.Options with inPurgeable set to true (and preferably with inInputShareable also set to true). 2) NEVER use Bitmap.createBitmap(width, height, Config.ARGB_8888). I mean NEVER! I've never had that thing not raise memory error after few passes. No amount of recycle(), System.gc(), whatever helped. It always raised exception. The one other way that actually works is to have a dummy image in your drawables (or another Bitmap that you decoded using step 1 above), rescale that to whatever you want, then manipulate the resulting Bitmap (such as passing it on to a Canvas for more fun). So, what you should use instead is: Bitmap.createScaledBitmap(srcBitmap, width, height, false). If for whatever reason you MUST use the brute force create method, then at least pass Config.ARGB_4444. This is almost guaranteed to save you hours if not days. All that talk about scaling the image, etc. does not really work (unless you consider getting wrong size or degraded image a solution). BitmapFactory.Options options = new BitmapFactory.Options(); options.inPurgeable = true; and Bitmap.createScaledBitmap(srcBitmap, width, height, false); solved my issue I had with out of memory exception on android 4.0.0. Thanks mate! That really is fabulous advice. Wish I could give you an extra +1 for taking Google to task for this amazingly rinky dink bug. I mean... if it's not a bug then the documentation really needs to have some seriously flashing neon signs saying "THIS IS HOW YOU PROCESS PHOTOS", cause I've been struggling with this for 2 years and just now found this post. Great find. Scaling your images down definitely helps, but this is an important step and what ultimately solved this issue for me. The problem with just scaling your images is if you have a lot of them, or if the source images are very large then you can still run into the same problem. +1 to you Ephraim. @ToAllTheAboveWhoClaimedTheirProblemSolved : Sorry to ask if wrong, But I just have some ImageViews(1280*720) and needs to scale them all the way from ldpi devices to xhdpi devices . Ok by using above lines "Bitmap.createScaledBitmap(srcBitmap, width, height, false);" . What will be my srcBitmap, width & height parameters? (Width and height of the ANDROID Device(s) I don't know). Please explain this sensitive issue. I know saying thanks in comments in not done on this forum. But after 3 weeks OOM debugging, I finaly found this post, which solved all my headaches. Also for me... want to give some more +1 but can't. Why is this not in the books, looks like a hidden treasure in bitmap handling..
Can you explain what this actually does? Simply telling people to add this doesn't help. This is a very bad solution. Basically you are not trying to fix the problem. Instead asking android system to allocate more heap space for your application. This will have very bad implications on your app like your app consuming lot of battery power as GC has to run through large heap space to clean up memory and also your app performance will be slower. then why android is allowing us add this android:largeHeap="true" in our manifest? Now you are challenging Android. The Android Training class, "Displaying Bitmaps Efficiently", offers some great information for understanding and dealing with the exception java.lang.OutOfMemoryError: bitmap size exceeds VM budget when loading Bitmaps. The amount of memory you are willing to commit to loading this image given any other memory requirements of your application. This answer (except the information reached through the link) do not offer much of a solution as for an answer. The important parts of the link should be merged into the question. This answer, like the question and the other answers are Community Wiki, so this is something the community can fix by editing, something that does not require moderator intervention. This inSampleSize option reduces memory consumption. Here's a complete method. First it reads image size without decoding the content itself. Then it finds the best inSampleSize value, it should be a power of 2, and finally the image is decoded. Note that 10 may not be the best value for inSampleSize though, the documentation suggests using powers of 2. I'm facing the same problem as Chrispix, but I don't think the solution here really solves the problem, but rather sidesteps it. Changing the sample size reduces the amount of memory used (at the cost of image quality, which is probably okay for an image preview), but it will not prevent the exception if a large enough image stream is decoded, of if multiple image streams are decoded. If I find a better solution (and there may not be one) I'll post an answer here. You only need an appropriate size to match the screen in pixel density, for zooming in and such you can take a sample of the image at a higher density. Can anyone explain what the REQUIRED_SIZE corresponds to? Is that pixels of one side, dips? Thanks! REQUIRED_SIZE is the new size you want to scale to. See my answer below, I had same problem and got it working simply by calling a different BitmapFactory method. why do you further divide o.outWidth / scale by 2? Since you're doing powers of 2, instead of scale *=2, you should do scale >> 2. For divide, you can do scale << 2. @Fedor i have tried your code it works fine when i process bitmaps in a listview in a single activity, if i use the same in tabs with list of images in each tab, getting out of memory error. How to deal with it? Great answer! But how do you get REQUIRED_SIZE dynamically at runtime (catering for different size displays)? This must be done once the View is being drawn but before the Bitmap is expanded. Is 70 the safe size for sampling? or would it make a difference if I used a bigger size? this solution helped me but the image quality is terrible. I am using a viewfilpper to display the images any suggestions? for removing the restrictions of using a power of 2 for sampling, you can use the next post: stackoverflow.com/questions/16408505/… . also for storing large bitmaps on native memory , you can use the next post:stackoverflow.com/questions/17900732/… . if you keep decoding different bitmaps to the same resolution, consider re-using the same bitmap, as shown here: stackoverflow.com/questions/17834024/… . I usually set options.inPreferredConfig = Bitmap.Config.ALPHA_8;. With this setting, each pixcel will be save by 1 byte instead of 4 bytes as default. @Fedor Shouldn't the catch block for FNFException have at least a Log? Empty catch blocks are always dangerous. Note that if this is still not enough to avoid OutOfMemoryError, you could use android:largeHeap="true" in your manifest. Hello, is there a away to specify the output image to be of a size of 400K. ? Does Piccasso take care of this? Calling .gc is useless. It merely hints to the compiler that now is a good time to do GC - but there is no guarantee that it actually happens at this point in time. use these code for every image in select from SdCard or drewable to convert bitmap object. use your image path instend of ImageData_Path.get(img_pos).getPath() . I have resolved the same issue in the following manner. that's all Right but i'm using multiple bitmap for draw circle in OnCreate and activity call 4-5 times so how to clear bitmap and how to remove bitmap and create again for second time when activity 0nCreate.. This approach scales the bitmap. But it doesn't solve the OutOfMemory issue because the full bitmap is being decoded anyway. I will see if I can look at my old code, but I think it did solve my out of memory issues. Will double check my old code. In this example at least, it looks like you aren't keeping the reference to the full bitmap, thus the memory savings. For me it did solve the memory issue, but reduced the quality of the images. According to the API, calling recycle() is not needed. It seems the images you have used is very large in size.so some older devices crashes occurs due to heap memory full.In older devices(honey comb or ICS or any low end model devices) try to use android:largeHeap="true" in the manifest file under application tag or reduce the size of the bitmap by using below code. It's a known bug, it's not because of large files. Since Android Caches the Drawables, it's going out of memory after using few images. 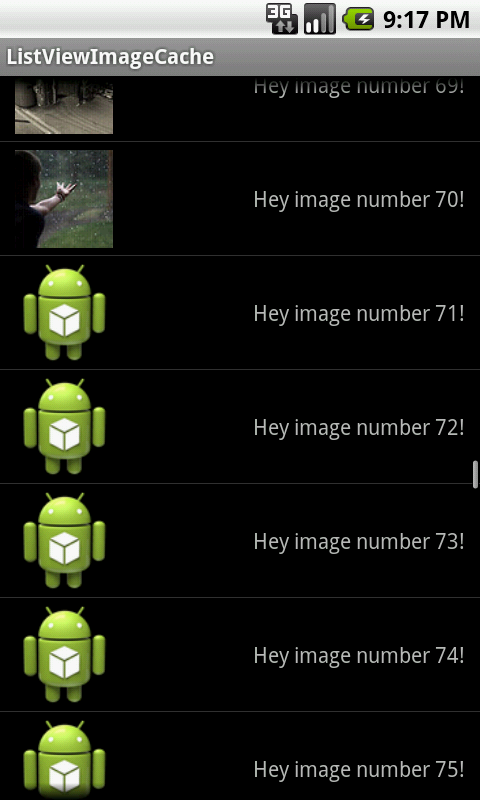 But I've found an alternate way for it, by skipping the android default cache system. I have seen a lot of questions about OOM exceptions and caching lately. The developer guide has a really good article on this, but some tends to fail on implementing it in a suitable way. Because of this I wrote an example application that demonstrates caching in an Android environment. This implementation has not yet gotten an OOM. Look at the end of this answer for a link to the source code. The images that are being downloaded are images (75x75) from Flickr. However, put whatever image urls you want to be processed, and the application will scale it down if it exceeds the maximum. In this application the urls are simply in a String array. The LruCache has a good way to deal with bitmaps. However, in this application I put an instance of an LruCache inside another cache class that I created in order to get the application more feasible. // that you want to allow in order to not scale images. // Assuming that one pixel contains four bytes. * Gets a bitmap from cache. * if it's inside the currentTasks list). * 2: check if an internet connection is available and continue if so. * 4: Remove the bitmap url from the currentTasks list. * 5: Notify the ListAdapter. * call notifyDataSetChanged() on the ListAdapter. * @param imageKey - The bitmap url (will be the key). * available bitmap or a placeholder image. * the user probably has flinged away the view. You shouldn't need to edit anything in the Cache.java file unless you want to implement disk caching. getView() gets called very often. It's normally not a good idea to download images there if we haven't implemented a check that ensure us that we won't start an infinite amount of threads per row. Cache.java checks whether the rowObject.mBitmapUrl already is in a task and if it is, it won't start another. Therefore, we are most likely not exceeding the work queue restriction from the AsyncTask pool. You can download the source code from https://www.dropbox.com/s/pvr9zyl811tfeem/ListViewImageCache.zip. I have tested this for a few weeks now, I haven't gotten a single OOM exception yet. I have tested this on the emulator, on my Nexus One and on my Nexus S. I have tested image urls that contain images that were in HD quality. The only bottleneck is that it takes more time to download. There is only one possible scenario where I can imagine that the OOM will appear, and that is if we download many, really big images, and before they get scaled and put into cache, will simultaneously take up more memory and cause an OOM. But that isn't even an ideal situation anyway and it most likely won't be possible to solve in a more feasible way. Yes you're right while is not so beautiful. I just tried to make it clear to everyone. Thanks for your code. @Thomas Vervest - There's a big problem with that code. ^ doesn't raise 2 to a power, it xors 2 with the result. You want Math.pow(2.0, ...). Otherwise, this looks good. Ooh, that's a very good one! My bad, I'll correct it immediately, thanks for the reply! whats , IMAGE_SIZE in this ? You are creating two new FileInputStreams, one for each call to the BitmapFactory.decodeStream(). Don't you have to save a reference to each of them so that they can be closed in a finally block? @Thomas Vervest What other changes should I do in Fedor's code in order to use your piece of code, beside setting a value for IMAGE_MAX_SIZE? I am specially interested to use fis.close(); but it throws error: Unhandled exception type IOException. @Adinia It works fine here... Have you copy-pasted the above code? @Thomas Vervest Yes, just replaced Fedor's whole decodeFile() with the above code. But now I just discovered your post about image caching and maybe I'll manage to find the answer there. I have a lot of images in my drawable folder. I want to reduce it's size , but decodeFile accepts the parameter as file.How can I make it the image from drawable image and send it this decodeFile. I think there is a small typo in the code. "scale" should either be cast to an int or declared as a double. It actually doesn't compile properly unless I set per Glenn's recommendation, so I'd say it's more than a matter of choice. I tried doing the same with Bitmap by converting them to byte and decode them instead of BitmapFactory.decodeStream(); But the image remains the same. Here is the code that i tried pastebin.com/EbXkXCtx. Can anyone help me with this? @boostedz06 have you tried weak referencing them? Even if your images are just 370x370, if you allocate enough of them over time and they are referenced Java will never release them. Read up on weak references here weblogs.java.net/blog/2006/05/04/understanding-weak-referenc‌​es, and convert your solution to use them, it'll probably fix your issue. How to use this code? How to call decodeFile()? @Babibu The documentation doesn't state that the stream is closed for you, therefore I assume it should still be closed. An interesting, and related, discussion can be found here. Note the comment by Adrian Smith, which relates directly to our debate. @ThomasVervest I am trying your code to decode Base64 String which I am getting from web server of my application, I tried writing that String into file and passed that file into above code but it does't decode to Bitmap. And in some devices it throws OOM exceptions too. @HimanshuAgarwal I don't think BitmapFactory decodes base64 encoded images. Have you tried decoding the base64 date into binary data first? What size is your image? The OOM exception could be caused by the file simply being too large for the device to handle, but admittedly this is a bit of a guess. Could you change IMAGE_MAX_SIZE to have a value in memory size . i.e. I want the IMAGE_MAX_SIZE to be 400K. ? I think you miss to put the getResizedBitmap() method code!!! All the solutions here require setting a IMAGE_MAX_SIZE. This limits devices with more powerful hardware and if the image size is too low it looks ugly on the HD screen. I came out with a solution that works with my Samsung Galaxy S3 and several other devices including less powerful ones, with better image quality when a more powerful device is used. I set the maximum memory used by this bitmap to be 25% of maximum allocated memory, you may need to adjust this to your needs and make sure this bitmap is cleaned up and don't stay in memory when you've finished using it. Typically I use this code to perform image rotation (source and destination bitmap) so my app needs to load 2 bitmaps in memory at the same time, and 25% gives me a good buffer without running out of memory when performing image rotation. I hope it will help you much. I am glad you mentioned Picasso, because it makes loading images much easier. Especially remotely stored ones.